The QuickFit Harness is the Quickest, Best Fitting Dog Harness Out There! Adjust each strap just once, then buckle on the harness with one click, and you’re good to go! 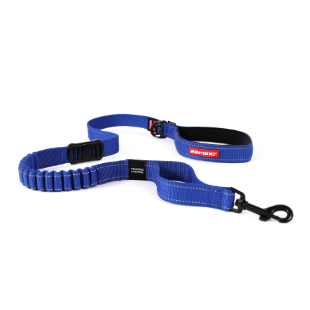 It’s so comfortable and simple that it can replace your dog collar too. We added an ID tag holder for that very purpose. The QuickFit dog harness is designed to minimize pinching or chafing, and is ideal for dogs of all sizes. Whether you’re looking for a sport dog harness that’s quick and easy to fit, or more safety for an athletic pooch, or anything in between, the QuickFit Harness is an ideal solution. Some of the Quick Fit Harness biggest fans are Flyballers! 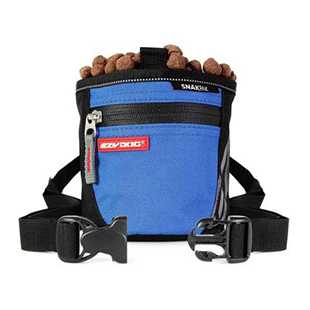 The Quick Fit Harness from EzyDog is the preferred flyball harness for the extreme sport enthusiast. When your dogs are raring to go, don’t waste time and energy trying to maneuver them into uncomfortable, complicated harnesses. Just click them into the QuickFit harness and start enjoying the great outdoors together! Don't forget to pair your harness up with an EzyDog dog leash! SLIP HARNESS OVER DOG’S HEAD AND ADJUST BELLY STRAP TO PROPER FIT. IF THE BELLY STRAP DOES NOT FIT MOVE TO THE NEXT SIZE. ONCE THE BELLY STRAP FITS, TAKE THE HARNESS OFF YOUR DOG TO ADJUST THE ONE TIME CHEST ADJUSTMENT, IF NEEDED. SLIDE THE NEOPRENE SLEEVE TO ONE SIDE AND ADJUST THE SANDWICH VELCRO. THE RED SAFETY PATCH IN VELCRO MUST BE HIDDEN. IF THE BELLY STRAP FITS, BUT THE CHEST STRAP DOES NOT, CONSIDER THE CHEST PLATE HARNESS AS AN ALTERNATIVE. Love it! I've bought them for other family members after getting my first one as a gift. Easy to put on and the ring keeps control in place. Tried others but were harder to get on and would move from side to side. We’ve had one of these harnesses for years and love it’s easy to attach and seems most comfortable. Finally bought 2 more for our other dogs ! Why we waited so long I don’t know . The best harness ever !!!!! So far I really like it. I like the chest plate harness, but it isn't as easy to get on quick, so I got this to try. The fit is great and it worked really well on walks. A ride in the woods on the bike is next. Amazing quality, perfect color, and awesome support as always. Have used different harnesses on my Dobie - once it was fitted to her, it is super easy to use - I love it & she does not pull as much! I would definitely recommend this harness! This is the third harness I buy. The first two worked just fine and are years old. They are the easiest to put on and to take off. Unfortunatelly, our new puppy's harness didn't last him one full week. He is a small dog with sharp shark teeth and the new harness was chewed and rendered useless, while he was wearing it, in less than an hour. This harness is awesome! Fits my girl perfectly. Very easy to buckle on. Fitted properly she is secure and I rest easy while walking. She loves it ! This harness was recommended to me by my Doggie Day Care place. They felt it would be a much better fitting harness than the one I was using. It is a great harness--easy to put on and seems to be more comfortable and a better. fit for my small terrier mix dog. This harness works great for my two Saint Bernards. One is 2 years old and the harness fits great on the biggest sizes but he is quite slim. Our female is more like your typical Saint and is a lot wider set. At 8 months the harness fits well on the largest settings but I am afraid she will grow out of it. They both wear the XL in size. Otherwise the design is great and they love wearing them over a collar on walks.